A chance to learn about handcraft techniques. Bottles ovens once dominated Stoke's skyline. Wedgwood is the jewel in the ceramic industry's crown. There’s almost a Tom Jones effect that happens when you tell women of a particular age that you’re off to visit England’s famous potteries region. My mother, for example, starts shaking me with an excitement I’ve not seen before or since, begging me to ‘tell her all about Wedgwood – one more time’, while her friends demand (with an almost frothy frenzy) that I find out why ceramics are so unaffordable when it’s really all ‘just a bunch of clay’. And just as I’m beginning to get excited about my trip to Stoke-on-Trent, my English husband says, “Stoke? Why would anyone want to go to Stoke?” Spoken like a man who left the country a good 20 years ago. Admittedly, Stoke-on-Trent – an industrial city teeming with decrepit warehouses and wastelands – is never going to win any prizes for beauty. Pulling up into the outskirts where everything is neon and graffiti-tagged, there’s little indication that the city was once a rural farming community before locals discovered their land had all the required ingredients for pot-making such as clay, coal and easy access to waterways to transport product to and from Liverpool. Bottles ovens once dominated Stoke’s skyline. 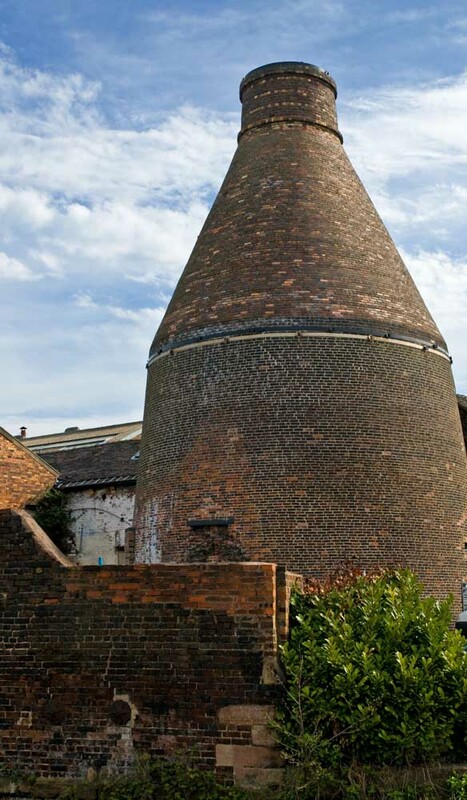 By the late 1700s, countless big name potters such as Wedgwood had moved in, dominating the city’s skyline with thousands of bottle ovens pumping thick black smoke into the air. Today, there are only a handful left – the result of the Clean Air Act passed in 1956 to help overcome the city’s pollution problem that at the turn of the 20th century still saw one in four children die in infancy and set the average age of death for adults at 46. Albert Bennion, an octogenarian volunteer who runs factory tours of Middleport Pottery is the first in five generations of his family to work outside Stoke’s ceramic industry (he was a teacher by trade), and says it was a difficult environment to grow up in. “Everyone had chest complaints and if you worked at a factory – and almost half of the population did back then – you had double the risk of dying at a young age.” Although cleaner, more efficient gas and electric kilns eventually replaced the bottle ovens, it was too late – many of the factories were soon demolished and the city fell into the rapid decline that my husband remembers. “It wasn’t ever a place you ever wanted to visit on purpose,” he says. The fact that Bennion and I are laughing about this as we walk the dusty walkways of Middleport, however, is telling about the changes sweeping the city – thanks in part to the Prince of Wales. “I can’t speak for other factories, but Middleport Pottery is what it is today because of Prince Charles’s Prince’s Regeneration Trust, which spent £9 million renovating this particular site alone,” says Bennion. Other potteries within town, he adds, were similarly revived over the last decade or two through a clever mix of community fundraising and the addition of innovative visitor experiences. Today, there are over 350 ceramics-based businesses in town, including countless factories with guided tours and – perhaps more importantly – factory stores. “I think it goes without saying that the World Capital of Ceramics is back,” says Bennion and he’s right; the area clocked an estimated 4.1 million visitors last year, cementing its place on the English tourist trail. With Bennion by my side, my potteries tour begins at Middleport where there’s an excitement in the front room that is almost palpable. From the ‘steam enthusiasts’ who are here to admire the steam engine that once powered the whole facility (“It’s the only William Bolton steam engine in existence!” chirps the man next to me as he maniacally takes a series of photos of the idle piece of machinery), to the mostly 50-and-over crowd in their raincoats keen to rampage through the pottery’s seconds and factory seconds stores on the ground floor, most appear keen on using the pottery and equipment on display as an opportunity to wander down memory lane. Me? I’m interested in the informative factory tour that snakes around the property, offering visitors the opportunity to see pottery being made using the same handcraft techniques as in the 1880s. Pottery, we quickly learn, is full of fascinating terms incomprehensible to those outside the industry, such as the ‘jigglers’ who shape plates from outside in, and the ‘jollys’ who shape bowls from inside out. Room after room, staffer after staffer, it’s quite a production, I mention to Carl, a plain old mould maker who likes to nod away to The Eagles as he works, and he smiles wryly. 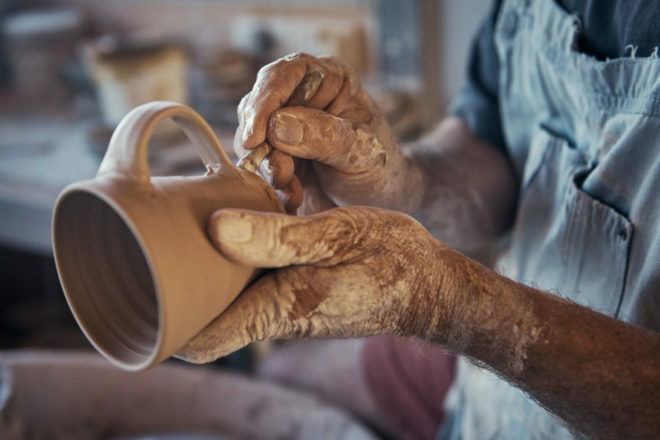 “It’s funny because we’re always hearing people complaining that quality pottery is too expensive, but 25 human hands go into the work of every piece here so when you think about the manpower that goes into it, it’s not a bad deal at all,” he says. I try to remember that at the cash register at the end of the tour, but I don’t mind admitting it still stings a little. Five minutes down the road sits the factory of ‘she of the polka dots and pastel designs’, Emma Bridgewater, which is at the other end of the spectrum – in both customer base and design – from Middleport. Bridgewater made her name in the mid-’80s when she came to Stoke to purchase a cup and saucer for her mother, couldn’t find anything suitable and proceeded to move in and create a multimillion dollar empire on the back of the designs she creates with her husband Mark. Today they have 280 staffers – one of whom is our guide Steph, who mentions that her own grandparents were teapot makers back in the day. “There’s a saying that clay runs in our veins here and I guess that’s true,” she smiles when I mention Bennion. In keeping with the ever-growing industry, Emma Bridgewater is increasing production from its current 32,000 pieces a week to 45,000 and works hard to engage visitors not only through its factory tours but with its on-site decorating studio, events and cafe (try the quiche; it’s delicious). As with Middleport, I wander steadily through each section of the factory meeting staffers as they quietly stencil at their Lazy Susans, surrounded by a kaleidoscope of colourful bunting. But there’s something that catches my eye – the average age of staffers. “Oh yes, we’ve actually seen the average age of our workers drop from 53 to 41 in the last two years alone,” says Steph, who adds that it’s just one more sign that the industry is beginning to draw young blood. “I predict we’re going to see big things emerge from this region in the next few years and it comes down to the next generation.” Taking in the kids sponging cups and plates with their parents in the decorating studio on my way out, I don’t doubt her for a second. Twenty minutes into our factory tour of Gladstone Pottery Museum, the former Gladstone China Works factory now preserved as the last complete Victorian pottery factory, it becomes clear that there’s a formula to these tours, and that perhaps you shouldn’t try to do several in one day. But just as I’m about to write off the factory as ‘just another pottery place’, I enter the museum’s Flushed with Pride exhibition, which is, yes, you guessed it, solely dedicated to ‘lifting the lid on the role that potters played in the development of the toilet’. Claiming to have the world’s best collection of Victorian decorative toilets (and that they do! ), I explore detailed – really detailed – stalls displaying the who, what, why, when and how of toilets, and spend time enjoying an interactive ‘put your hand in the hole to feel the surprise’ exhibit (yes, it’s as bad as it sounds). Shrieks of laughter can be heard echoing around the whole museum that only calms down once visitors enter the pottery’s tile gallery, which features everything from Gothic Revival to Art Deco tiles. Wedgwood is the jewel in the ceramic industry’s crown. If you need any proof that Wedgwood is the jewel in the ceramic industry’s crown, look no further than the gargantuan World of Wedgwood, which opened its doors in July 2015 to offer visitors an experience they’ll never forget by way of a museum, factory outlet, flagship store, Wedgwood Tea Room, Wedgwood Tea Emporium, estate walks and a range of ‘try it yourself’ studios such as the Design Studio and Decorating Studio. 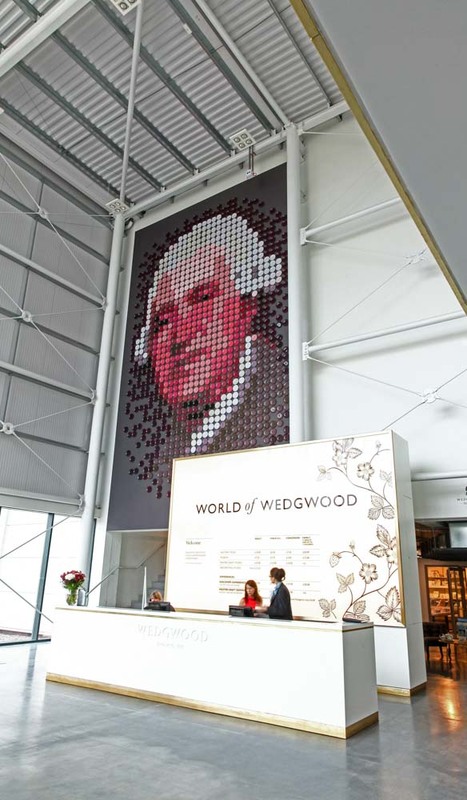 My first clue that things are going to be different to the other potteries I’ve visited is the nine-metre contemporary installation of Josiah Wedgwood, who founded the company in 1759. What follows, I soon discover, is a walk through 3000-odd pieces of ‘don’t exhale or you’ll break something’ pieces featuring some of the brand’s most iconic designs. These include works like the Parian Venus Bust, 1849, and the Apotheosis of Homer Vase, 1786. 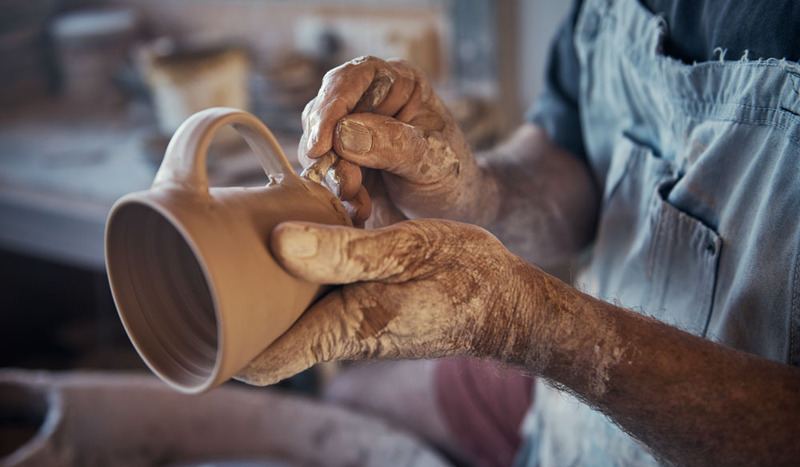 The tour gives you the opportunity to see hundreds of experts work across all aspects of pottery-making including casting, figure-making, pattern-decorating, hand-painting (I watch a plate being painted with real gold – an ‘additional extra’ that will see each plate retail for over £1000). Far cheaper is the vase I make in the Master Craft Studio, which arrives at my home beautifully packaged six weeks later and is quickly ‘Jackson Pollocked’ by my two daughters. It isn’t a Wedgwood as you’d know it, and it’s never going to make it to the shelves of David Jones, but that it’s been touched by three pairs of hands (two of them very special) is quite simply, priceless. Getting there: Qatar Airways flies daily from Sydney, Melbourne, Perth and Adelaide to Birmingham via Doha. Once there, a one-hour train journey will connect you through to Stoke-on-Trent. Staying there: Check into the 17th-century, Grade I-listed hotel Crewe Hall not far from Stoke in the town of Crewe.